From this two bedroom townhouse in Kissimmee’s Mango Key community you can be at the Disney parks in less than 15 minutes! Immerse yourself in the Florida lifestyle as you head to the pool and spa overlooking the lake at the heart of the community. King-size bed, ceiling fan, flatscreen TV, slide closet, ground floor. En-suite bathroom shared with the house contains a shower over bath, sink unit, WC. Twin beds, ceiling fan, flatscreen TV, walk-in closet. En-suite bathroom contains a shower over bath, sink unit, WC. Soak up the sun from the patio area at the rear of your two bedroom townhouse on the gated community of Mango Key in Kissimmee. This is the perfect base for your Florida adventure, with the theme parks that Florida is world-famous for in easy reach of the community. From your townhome you can be at the Disney parks in less than 15 minutes, SeaWorld in around 20 minutes and the Universal parks in less than half an hour. Why not try out the community facilities, which include a pool and spa overlooking Mango Key Lake, or cook alfresco using the communal BBQ area. 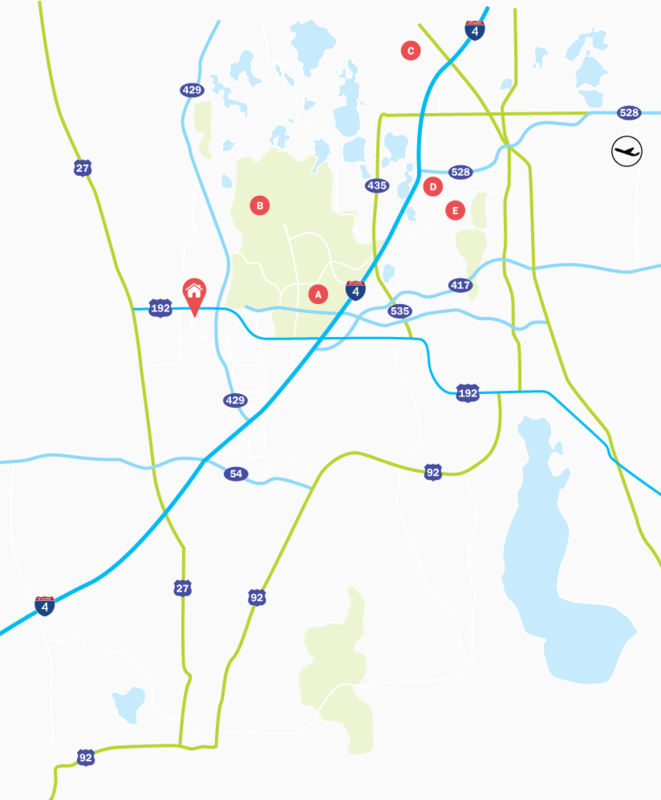 If you want to dine out while on your holiday, there are a great range of bars and restaurants along the popular US192, just a few minutes from your townhome, which have something to suit all tastes and budgets. Living Accommodation - At the heart of this townhome is the light and airy family lounge, with comfy red sofas seating five guests. Watch the large flatscreen TV, or head out to your private patio through the slide doors at the back of the property. To the right of the lounge is the dining area, which has a glass-topped table with room for four guests to gather together and enjoy dinner in front of a further set of doors to the patio. The kitchen, with white appliances, is next to the dining area and has room for two guests to enjoy a light bite at the breakfast bar. Upstairs on the landing is a sofa where you can read a book in peace. Bedrooms - The Master bedroom is downstairs to the right of the front door. It has a King-size bed and an en-suite bathroom which is shared with the house. Upstairs in the neutrally-decorated Bedroom 2 are Twin beds and a walk-in closet. Bedroom 2 also has an en-suite bathroom. Both bedrooms have flatscreen TVs and ceiling fans for the convenience and comfort of all guests. Outdoor Living - At the rear of the townhome you have your own enclosed patio area where you can enjoy breakfast at the table, or sit on the wicker sofa and watch the world go by as you plan for the day’s adventures! Mango Key is a gated community near the Disney theme parks, and an extensive range of shops, bars and restaurants. The 33 townhouses were constructed in 1992 and are surrounded by beautiful conservation and Mango Key Lake. Community facilities include a heated swimming pool and spa and an outdoor BBQ and picnic area.